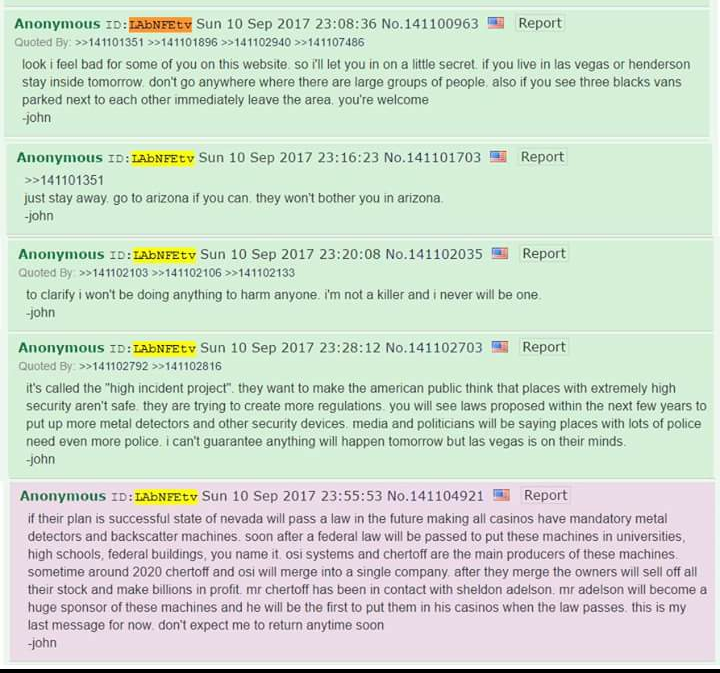 So you can see that they knew something like this would be coming as far as Mandalay Bay goes, but who would’ve seen it affect other properties like Wynn Resorts, Red Rock Resorts, Caesars Entertainment, and Boyd Gaming? 4 other entities suffered the consequences of the actions at one casino/hotel, but when it’s all said and done, MGM lost almost 1 billion dollars. If this ritual was strategically planned, how could the owner of MGM knowingly lose that much money? Maybe they knew that there was money to be made with the placement of new mandatory regulations for security at these casinos. 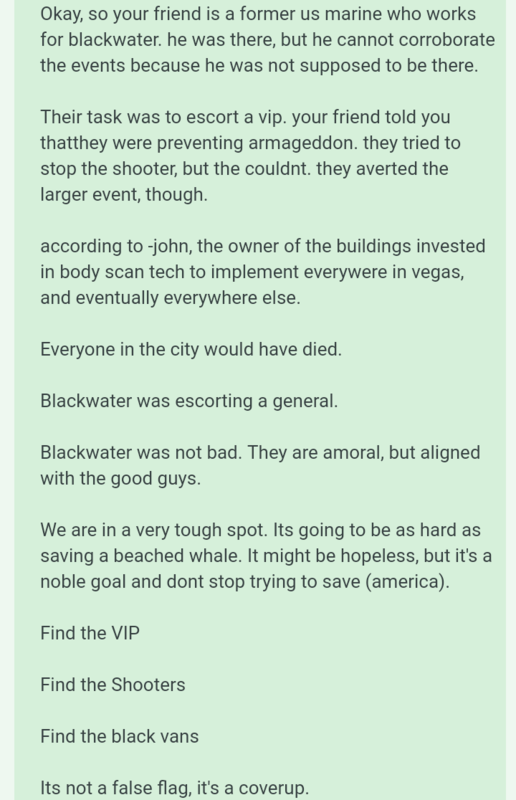 They are already in talks about new security measures now (https://seekingalpha.com/news/3298957-las-vegas-casinos-add-new-security-measures & http://news3lv.com/news/local/strip-properties-weigh-new-security-measures-in-wake-of-las-vegas-mass-shooting). Another thought about losing that much money over night would be from the ritual side of it. When you have a certain end game, it doesn’t matter at what cost the loss is. These occultists will sacrifice lives and money if it achieves what they need done. Is this what happened? It may be part of it but I don’t think that’s the full story. MGM knew full well what was going on in my opinion, based off of no mention of security footage or lack there of. They knew something was going to happen and they either closed their eyes (pun intended) or played the game. But why? So we have the CEO of MGM Enterprise’s ie Mandalay Bay on the council for the National Infrastructure. 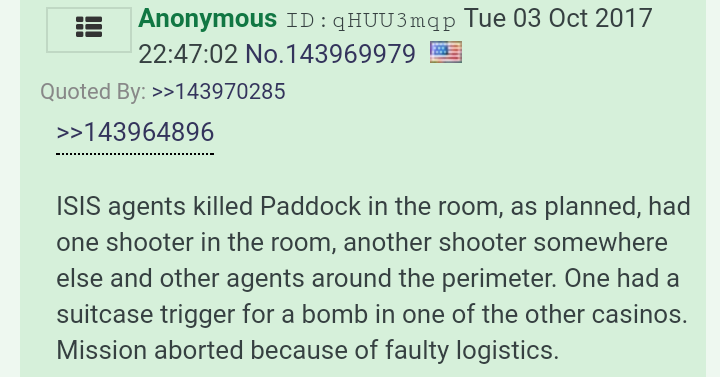 What caught my attention is that the executive order for this group which was passed by Obama was about to run out of steam on September 30th, the night before the shooting in Vegas. Now Murren has ties to Ceasers in Vegas and they have actually joined together in a deal in Atlantic city. I’m sure of it that Trump has ties and relationship with all these Vegas and Atlantic city tycoons being that he is in the same business. Now the question is why did this happen at the Mandalay Bay? 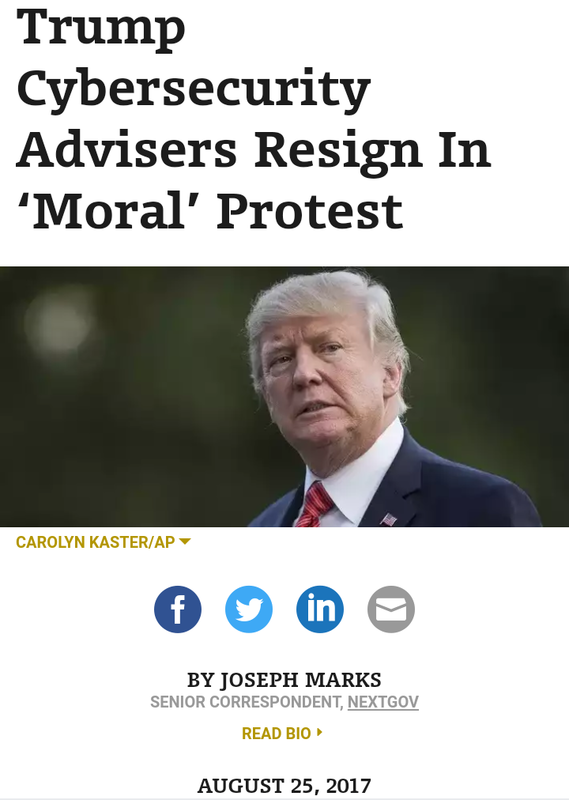 The same place where Murren owns and Murren just so happens to be on the NIAC who pissed off Trump in August. I’m not saying Murren was a part of this but he is connected to this. Now Murren made a deal with Ceasers in Atlantic city where Trump has casinos and Ceasers is owned by Apollo Global who just so happens to own Blackwater turned Academi. Everyone is somehow connected here. Academi is the group of private contractors who are stone cold killing mercanaries. 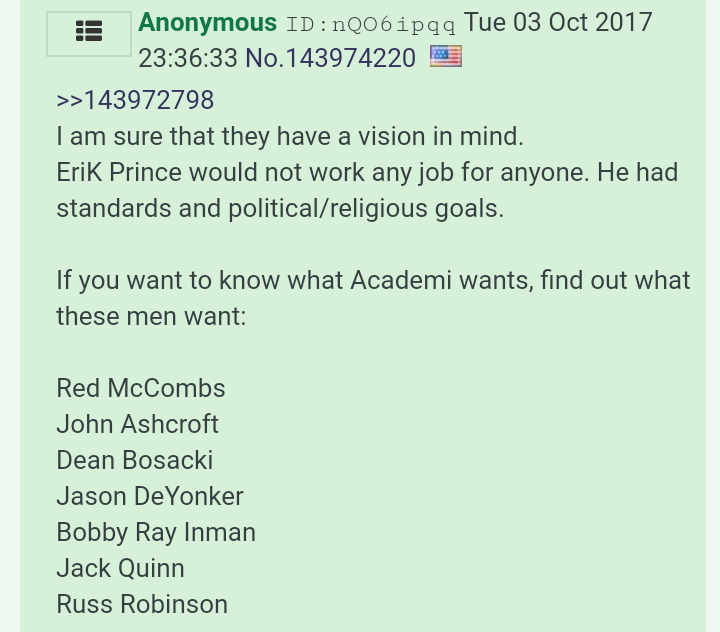 Academi is still owned by Erik Prince, but now he just isn’t the poster boy like he was with Blackwater. You have to look at the Prince/Trump private military connection to see what could’ve possibly happened here. And don’t forget this….NIAC never received a executive order to continue with Trump. If you forgot what this Paris Agreement was and what it would’ve done to the US then read Trumps speech on it here. I cane across this tidbit of information from a post. I will post it in its entirety. “Did you know that Jim (James) Murren is the chairman and CEO of MGM Resorts International which owns the Mandalay Bay Resort and Casino? Did you know that Jim Murren is also a sitting member of the Homeland Security National Infrastructure Advisory Council and he’s responsible for getting legislation and regulations passed for security & technology infrastructure in public places? Michael Chertoff is the Former United States Secretary of Homeland Security and co-author of the US Patriot Act. Michael Chertoff has a group called, the Chertoff Group founded in 2009. It’s a “security and risk management group”. The Chertoff Group has a vested interest in a massive push for the x-ray backscatter machines because they’re the biggest producers of these machines, along with another firm called OSI. It is claimed the plan these two firms has (and according to the source allegedly was carbon dated September 11, 2017) is to pass laws that require these machines in all public places. This will be, of course, in the name of safety. With the ‘hook’ of fear utilized by mainstream media outlets Americans will be happy to do it and even foot the bill. Just like we did with the Patriot Act after 9/11. When this is accomplished they’ll merge their firms in 2020, sell their stocks and make billions in profits. All while making the US more like the middle east, which is their ultimate goal. The government wants these machines going up in all the casinos in Las Vegas and eventually in places like parks, public schools, grocery stores, libraries, restaurants, public transportation stations, all event places, malls, everywhere you can imagine. They want to make America like the middle east as far as “security” goes. The Chertoff Group will make billions from this deal. Wynn Casino already has backscatter machines in their casino and it hasn’t even been four days. Supposedly there are already newspaper stories mentioning this although I’ve not seen one myself. The head of the Department of Homeland Security has been on CNN and talked about these machines and how we need them.